First up, Netherlands Space Office, Synthetic Aperture Radar looks like it is a free flying SAR mission after finishing resupply. OSC has been providing a lot of useful feedback and help in the process. We also have some other ideas for how to utilize Cygnus as a telerobotic free-flyer. 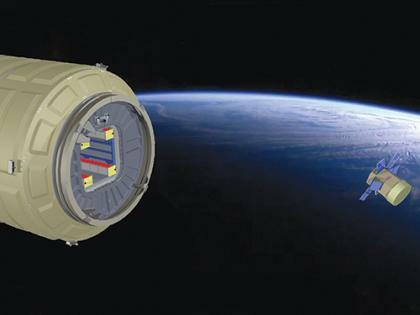 How about deorbiting space debris collected by another spacecraft? What about the HEART HIAD test? I'd put reentry research up there beside SpaceX's first stage landing tests as potentially game-changing technologies. If you read papers like this http://solarsystem.nasa.gov/docs/9.2%20Hughes%20Hypersonic%20Inflatable%20Aerodynamic%20Decelerator%20%28HIAD%29%20Technology%20Development%20Overview.pdf it seems like the HEART technology and engineering is still very much being developed. Jon Goff, what would the power requirements be of a magnetic decelerator sized for something like Cygnus? Seems like such a thing would really benefit from a method to generate power from the reentry itself. Two "cheap" asteroid or near-infrared survey telescopes. ^^^Interesting. The Cygnus power and propulsion bus could also be used to deliver new modules to ISS or other spacecraft. The bus could detach and fly away after delivering a module, in the case of ISS. Or remain and provide power for a BEO mission. I like that idea, although less relevant to ISS now than, say, 10 years ago. Nope. Thermal/"pointing"/acquisition/data handling not enough. And the big problem is in repurposing the optics for very different application then they were designed for. About the only interesting application I can think of for this and space telescopes in general would be to apply the ISS cargo capability CBM to allow replaceable instrument sections, such that you could track technology developments more quickly to on orbit instrument use in a unmanned, automated way. No SSRMS, but something along the lines of Jon Goff's "sticky boom". A welcome and smaller alternative to an ESA hab. The most important, and arguably interesting argument for a Cygnus-based hab is the inclusion of an airlock. Figuring the extended-Cygnus, about 1/3 the length would be an airlock, the closest 2/3 extra supplies. This, as mentioned in the article, would prevent the wasteful and dangerous decompression cycle of Orion. Combined with added supplies, missions would be longer and much more productive. Of course some additions and modifications would be needed, the most obvious is the lack of an optics package. NASA only received the mirrors and focusing mechanics, but would need to develop the optics package, reaction wheels ("pointing"), a sun shield extension and possibly your request for increased "data handling". The second issue is the existing low orbit of Cygnus which limits telescopes. A highly elliptical orbit would have a more stable, less obscured (thermal environment and atmosphere), better opportunity every apogee to stare at the asteroid belt - my preference - or gather near-infrared survey images. I'd suggest this is the limits of the mirror set provided to NASA and Cygnus is exactly the platform needed to carry it out. *edit; And I meant 7.8ft earlier, not meters. the inclusion of an airlock [...] would prevent the wasteful and dangerous decompression cycle of Orion. Combined with added supplies, missions would be longer and much more productive. I'd like to see the long or extra-long Cygnus be adapted for the Inspiration Mars project - assuming it ever comes to pass, that is. I should think they'd have sufficient volume for 2x people, their supplies and a life support system! Docked to a Command Module (Dragon or similar vehicle) and it's outside coated with mylar and kevlar for thermal and micrometeoroid protection. Radiation? The interior with high density polyethylene and the crew's supplies. If we can get approvals to fly HatchBasket, one of the hosted payloads we wanted to prove-out on Cygnus was a variant on our Sticky-Boom type capture/servicing arms. Do you think the service module on Cygnus could be adapted to easily add new large modules like the nodes or another permament MPLM to the ISS? The extra utility might be useful. But can the structure support the weight of a new ISS module? Would the addition of a way to separate the Service Module from the cargo be too much trouble for its worth? I was just wondering if this was feasible or if there were better options. The idea of using Cygnus a EAM for BLEO Orion missions is definitely a good idea but is long way off. A more near term option is to use it with Dragon of CST100 for extended LEO missions. To keep costs down the Cygnus would launch on same LV, failing that, use it to supply ISS first then rendezvous with it after it departs ISS. The EAM + capsule should be able support 2 crew for 6-8weeks or 4 (2 paying passengers) for 3-4 weeks. Without the usual ISS maintenance issues to take up crew time, these missions could get a lot of experiments/science done. At end of the mission Cygnus could be disposed or alternatively it might be able to support another crew mission, capsule would need to resupply it. Do you think the service module on Cygnus could be adapted to easily add new large modules like the nodes or another permament MPLM to the ISS? There is no plan to do anything like that. Full stop. Repeat: there is no plan to do anything like that. Would the addition of a way to separate the Service Module from the cargo be too much trouble for its worth? Yes. See the post below, and the entire thread in which it appears. Cygnus requires forward thrusters for control authority over it and its nose-mounted payload. Cygnus cannot simply mate with a payload and move it around, the payload must have forward thrusters that somehow join with the Cygnus prop system. I was just wondering if this was feasible or if there were better options. Yes, there are better options for delivering modules to space stations. Yes, there are better options for ways to use Cygnus beyond "mere" ISS resupply. My opinions only; your mileage may vary.